The night is portrayed here in this art nouveau Mucha Nuit tapestry from the work of Alphonse Mucha. From the Les Heures Du Jour or 'Hours of the Day' series in 1899 by Mucha, we see a woman in various times of the day. In this tapestry the woman is seen sleeping in the natural surrounds of the woods, and bordered by flowers. The woman is seen in flowing delicate gowns a hallmark of Mucha's works depicting women. The background shows us the darkened woods and the hint of the moon seen through the trees themselves to create a dreamlike background to this scene. 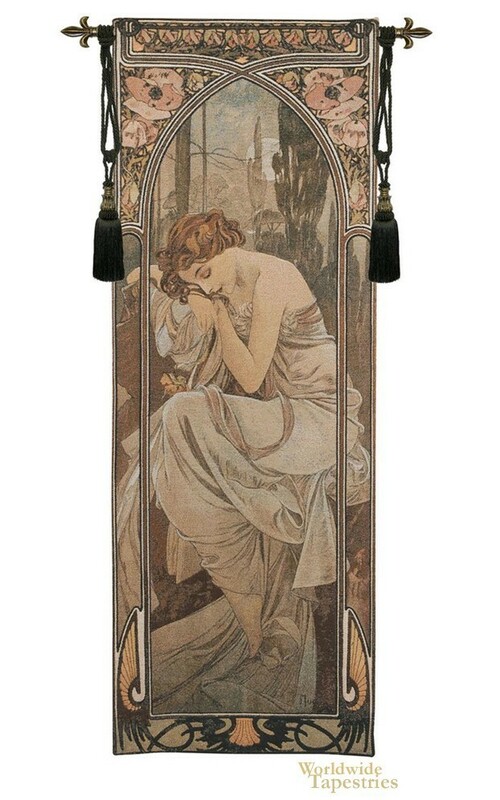 This art tapestry "Mucha Nuit" is backed with a lining and has a tunnel for easy hanging. Note: tapestry rod and tassels, where pictured, are not included in the price. Dimensions: W 26" x H 74"